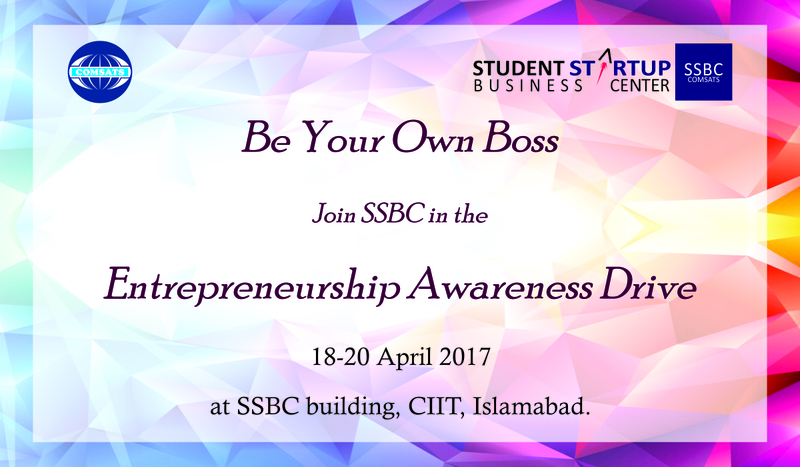 Student Statup Business Center (SSBC) is organizing a three day Entrepreneurship Awareness Drive at CIIT, Islamabad on 18-20 April 2017. The objective of the drive is to create awareness about services being offered at the SSBC, in order to help them transform their ideas into viable entrepreneurial ventures. The event will comprise of motivational talks as well as informational sessions connecting entrepreneurs and industry leaders with students and faculty having potential entrepreneurial ideas. The Drive will also comprise of student centric activities including movie screening and a musical fiesta. The Drive will be inaugurated by Rector CIIT, Prof. Dr. Raheel Qamar, T.I, at the SSBC (BIC) Building on 18th April, 2017 at 09:30 am. Students and Respected Faculty members are cordially invited to participate in order to draw maximum benefit from these activities which kick off at the inaugural ceremony.